This sounds like the swing Holder took last summer at harsh sentencing, when he directed federal prosecutors to stop specifying the quantity of drugs for certain offenders so as to avoid triggering a mandatory minimum sentence. Then as now, it’s not clear how a grand pronouncement plays out on the ground. Traditionally, pardons have often turned on whether prisoners significantly cooperated with the prosecution, were seriously ill or elderly, or simply serving an unduly severe sentence. The key limiting factor on Cole’s new list of standards is the requirement that a prisoner would have done much less time if sentenced today. That could be a narrow category: drug offenders sentenced to long terms before the Fair Sentencing Act of 2010, which reduced the disparity between sentences for crack and powder cocaine. If that’s all the proposed reform adds up to, it’s too minor a tweak to the system. [T]he biggest news for criminal-justice reformers has been the administration’s appointment of a new pardon attorney to oversee the program: Deborah Leff, who spent her years at DOJ working on the Access to Justice Initiative, an agency meant to help low-income defendants get a fair hearing in court. “Poor people often do not have access to counsel, and when they do get an attorney, that lawyer is often overworked, undertrained, undercompensated, and placed in a system that encourages a quick plea bargain and discourages carefully listening to the needs of clients,” she wrote in an article with Melanca Clark for the American Bar Association. Those who come from the prosecutorial side of things—which is most everyone at the Department of Justice—tend to be more skeptical of the idea that convicted criminals can be reformed. 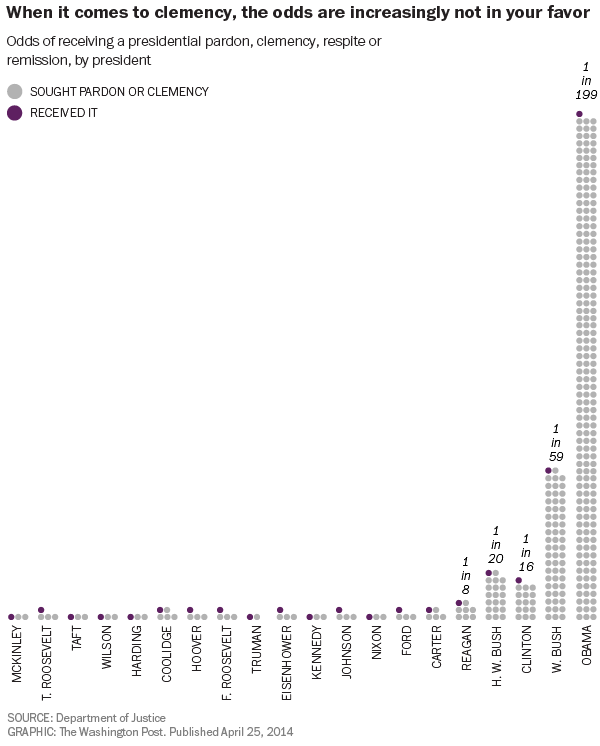 But Leff’s background makes her more likely to be sympathetic to requests for clemency.